The chancellor has opened the door to tax rises in the Budget, saying the government "may have to raise a little more tax" to pay for the NHS. Philip Hammond told the BBC he wanted to "minimise" any impact on the economy if taxes had to rise to cover the £20bn spending boost pledged for the NHS. "We may have to raise a little more tax in order to support the NHS and deliver on our pledge," he said. However, he added, "I am a low-tax Tory." 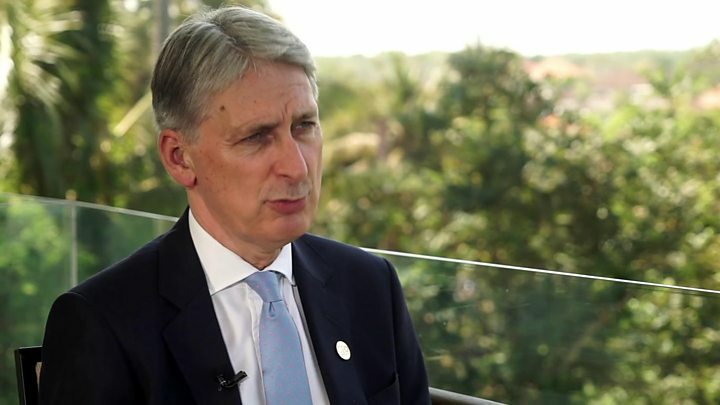 Speaking to me at the International Monetary Fund annual meeting in Bali, Mr Hammond said that if taxes have to go up, "it's important that we do it in a way that minimises any negative impact on the economy, minimises the effect on people". "I will always do everything I can to minimise the necessity for any increases in taxation, and to keep the burden of taxes as low as I possibly can," he said. He refused to commit to keeping Conservative election manifesto promises made last year to raise the income tax threshold - so that workers pay less tax - and cut corporation tax for businesses. "These are both very important commitments that were made," he said. "We've also made a very important commitment to a big increase in funding for the National Health Service, something that we didn't anticipate at the time we wrote our manifesto. "We're being very open and frank with the British people that if we're going to have rising standards of healthcare, with an ageing population in a world where technology is constantly making new treatments available, we are going to have to pay a little more to support that." Mr Hammond, who delivers his Budget in two weeks' time, said there had been a step-change in the Brexit negotiations and that he expected an economic "upturn" if a deal was agreed with the rest of the European Union. He said that a public finances buffer of £15.4bn built up in case there is a disorderly Brexit could also be used to support public services. "I will maintain fiscal firepower so that if we do find that things don't turn out the way we want, we have got the ability to support the British economy and minimise any effect," he said. "But if we don't need that fiscal firepower, then of course it can be used for other things - either support for public services or further paying down of debt or indeed reducing taxes." If there is no deal or a disorderly Brexit, then any dividend would be lost, he said. "If we leave the EU without a deal, we will be in very different situation and we will need a different set of responses," he said.